Visual Studio Application Insights (Preview) enables you to find performance issues earlier, diagnose crashes faster, and get smarter about users with a 360° view of your apps and services. With the Power BI content pack, you can connect to Application Insights (Preview) and explore out-of-the-box metrics of applications’ users, sessions, and page views for the last 30 days. The content pack provides a dashboard, set of reports, and a curated data set to help you discover more about your data. 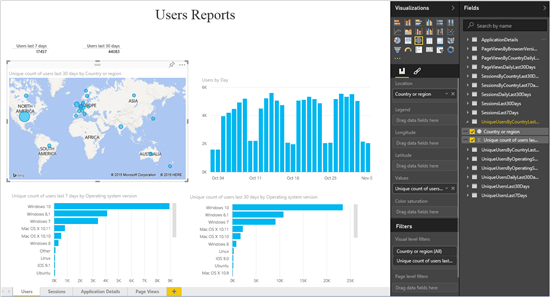 This post will explain how the Power BI content pack can help you explore your Application Insights data. For additional details on how to get started, please see the Application Insights content pack for Power BI help page. It’s easy to get connected to the content pack, just provide the Resource Name, Group and Subscription ID to get started. Signing in will complete your connection, allowing your data to begin loading and a dashboard to be automatically created. From the out-of-box dashboard you can select any of the tiles and drill further into the 4 reports. 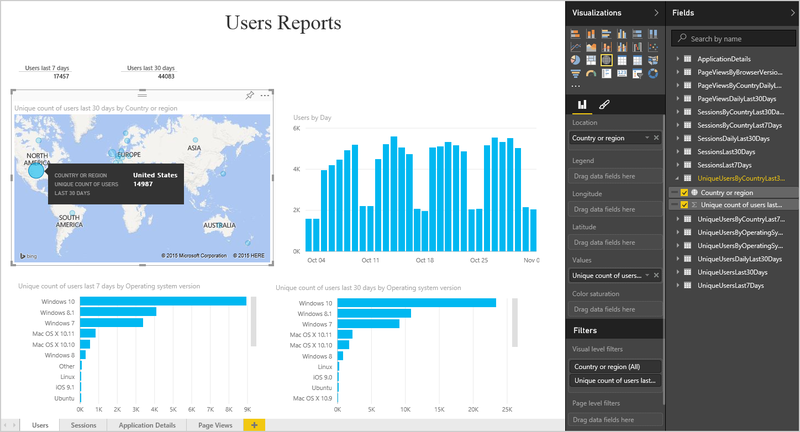 For example, if you select the Users by Country tile, it brings you to the Users report. Once you are on a report you have the ability to hover over the visualizations to see additional details. This report highlights different metrics around your users, including users by day, country, operating system, and more. From any of the reports you can pin the visualizations or tiles to the dashboard by hovering over it and selecting the pin icon. You can add new tiles or move existing tiles to customize your dashboard. After the initial import, the dashboard and the reports continue to update daily. You can control the refresh schedule on the dataset. 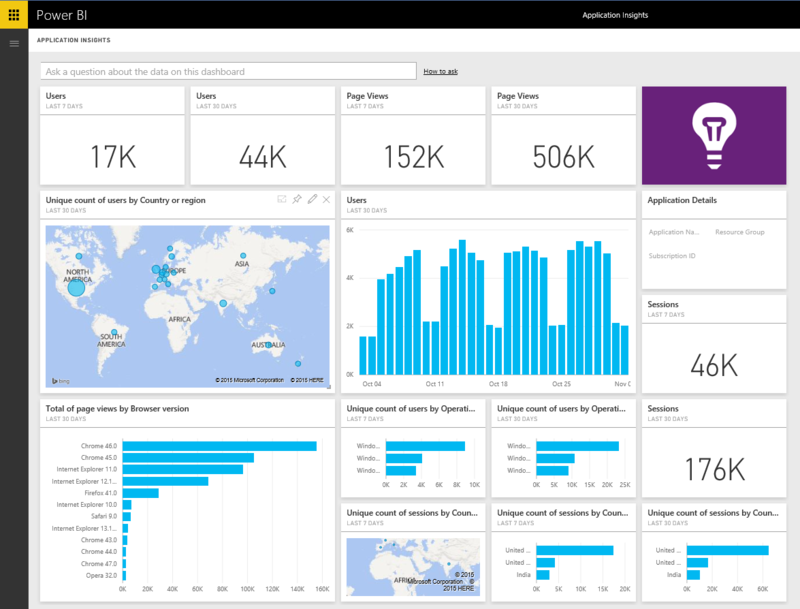 The Application Insights content pack for Power BI provides a set insights into your application usage that you can use to explore your data even further.